It seems game announcements are all the rage today, as we have another co-op game announcement to bring you. 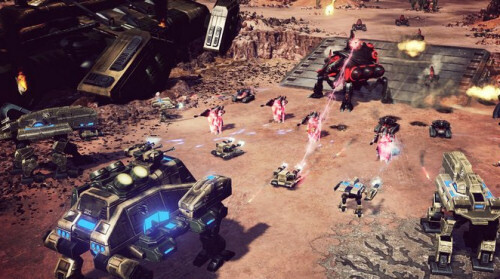 While this was more or less a foregone conclusion, especially after it leaked yesterday on Twitter - but Command and Conquer 4 has been officially announced today by Electronic Arts. Gamespot has the exclusive unveil, as well as an interview with Samuel Bass, the game's lead designer. C&C 4 looks to mix things up a bit for the classic RTS series by providing class based gameplay, persistent stats, skill progression and of course co-op! The biggest change to the series looks to be the addition of "classes" to each faction. These three classes; Offense, defense and support, will each have their own unit types and structures available to them. While this might seem a bit detrimental to single player, in co-op these additions really shine. Players can each assume a different class role for the mission presented to fully take tactical advantage of the battle. Speaking of co-op, C&C 4 promises to deliver a true co-op campaign across the entire game's story. GS: We also understand that like Red Alert 3, C&C 4 will have a cooperative campaign mode. Why bring back this feature for C&C4? What will it add to the game? SB: Yes, Command & Conquer 4 will feature two-player co-op across the entire campaign, complete with multiclass play and integrated player progression. The public reaction to Red Alert 3's co-op play was hugely positive, and we think Command & Conquer 4's unique design elements will further enhance the RTS co-op experience. So on top of all this is the ability to earn experience for every kill, every objective and every mission. This experience is then used to unlock new abilities and units, and is persistent across all modes of gameplay including single player, co-op and multiplayer. Command and Conquer 4 will finally wrap up the Tiberium Saga, bringing a conclusion to the Brotherhood of Nod, GDI and Kane. Here's the real kicker - despite all of the console ports of the previous C&C and Red Alert titles, Command and Conquer 4 is staying true to its roots and being developed exclusively for the PC.